Tom Petty is gone and over the years although I play a lot of his music, for some unknown reason I have never painted one of his songs. I am doing that now. I pick his song Runnin’ Down a Dream for many reasons, but mostly because I thought of it as a car driving song. I grew up in rock music with Del Shannon and his classic song Runaway. Hearing Del’s name and loving car songs, and being raised in my youth on and in Mustangs, Runnin’ Down a Dream became an instant classic. 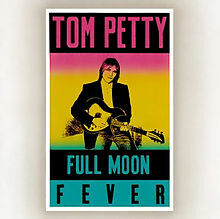 The main background colors of this artwork comes from Tom Petty’s 1984 Album Full Moon Fever. Runnin’ Down a Dream was a hit single from that album. Now, for the words used in this artwork I picked “Woo hoo, Woo hoo, Woo hoo.” My, you don’t ask, why did I pick those words? I know they are not really part of the lyrics, but for me they say it all, covering all the emotions for this music. I don’t think this will be the last Tom Petty song. I am too much into rock. Of all the long list of great songs by Tom Petty I am leaning to also paint Learning to Fly. That song title is a good fit with Runnin’ Down a Dream. My take on both of the titles is that they both summarize this moment of my artist career: I am running down a dream, and I am also learning to fly. ~ by Scott Von Holzen on 10/26/2017.